Rob Capriccioso is a writer based in Washington, D.C. He's written about politics and culture for many publications, including The New York Times, The New York Post, The New York Sun, The American, and TMZ.com. He's a contributing editor to Campaigns & Elections' Politics magazine and a reporter for Indian Country Today. 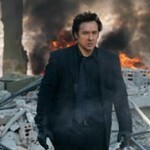 Big Mad John: An Interview With John Cusack on War, Inc.